The PlayStation 4 does more than play your favorite video games. It also serves as a media hub for watching Blu-ray movies or streaming flicks from YouTube, Netflix or HBO GO. But using a game controller as a remote control for watching movies isn't exactly convenient. All that has changed with the introduction of the Sony PlayStation 4 Universal Media Remote. Standard remote controls don't work with the PlayStation 4 because it has no infrared receiver. Until now, viewers were stuck with a gamepad for controlling media playback. The new universal remote works around the PlayStation 4's lack of an infrared sensor with Bluetooth technology. It can control up to four devices, including other infrared-controlled devices such as set-top boxes, TVs and audio receivers. Aside from the usual buttons found on standard remote controls, the new universal media remote includes the trademark circle, X, square and triangle buttons from the PlayStation controller. There is also a share button and a button for turning your PlayStation on or off. The remote runs on two AAA batteries, which can last up to about six months. 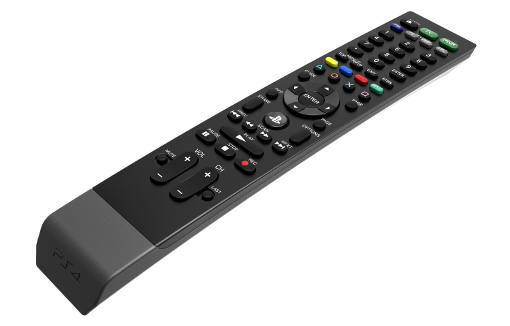 The new universal media remote is officially licensed by Sony and made by Performance Designed Products (PDP). PDP is not the only accessory maker providing remote controls for the PlayStation 4. Insignia, an in-house brand of Best Buy, offers the Media Remote for PlayStation 4, but it's not officially licensed. Logitech's Harmony Elite universal remote controllers are also compatible with the PlayStation 4, although you can't use them to turn on your console. Universal remotes compliant with the HDMI-CEC protocol also work with the PlayStation 4. Sony had previously released an official remote for the PlayStation 3. You can buy PDP's Universal Media Remote for the Sony PlayStation 4 on Amazon for $29.96. ...that Sony is restricting other devices from powering on the PS4, which is effectively crippling the production of third party universal remotes. My Blu-Link universal remote for the PS3 and five other devices is the best remote I’ve ever had, hands down. They won’t be making one for the PS4, unfortunately, and I’d imagine that this restriction is a major reason why. Logitech Elites are far too expensive for a remote that won’t power the system on. Really needs at least five additional devices, as well, and the ability to learn functions from other controllers, which I’m guessing will be absent. May as well just use the DS4.